Three Zurich-based bankers are wanted in connection with the case. 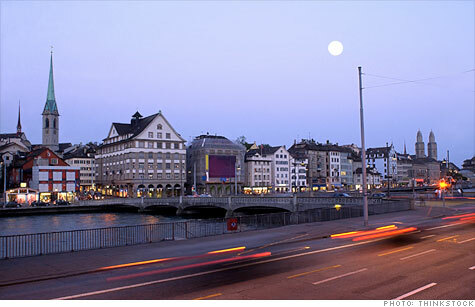 NEW YORK (CNNMoney) -- The Justice Department charged Switzerland's oldest bank Thursday with helping American taxpayers hide more than $1.2 billion from the Internal Revenue Service. The case marks the first time an overseas bank has been charged in the U.S. for aiding tax evasion. The Swiss bank Wegelin and Co., founded in 1741, is accused of allowing American clients to set up accounts under false names or for sham companies in order to evade IRS detection. The charges follow the indictment of three Wegelin bankers last month, all residents of Switzerland who remain at large. In 2009, the U.S. government settled a tax fraud case involving American customers with Swiss banking giant UBS (UBS) that proved diplomatically challenging due to Switzerland's strict bank secrecy laws. UBS ultimately paid $780 million in fines and restitution and agreed to hand over the identities of a number of its U.S. customers. Prosecutors allege that as UBS stopped handling undeclared U.S. accounts in 2008 and 2009 amid scrutiny from American authorities, Wegelin attempted to scoop up their business. "Wegelin Bank aided and abetted U.S. taxpayers who were in flagrant violation of the tax code," Manhattan U.S. Attorney Preet Bharara said in a statement. "And they were undeterred by the crystal clear warning they got when they learned that UBS was under investigation for the identical practices." The government has seized more than $16 million from Wegelin's U.S. bank account, which was allegedly used for clandestine money transfers to American clients, the statement said. A spokeswoman for Wegelin did not immediately return a request for comment. Wegelin announced last week that it was selling itself to Switzerland's Raiffeisen Group "as a consequence of the increasingly threatening situation... in the US tax dispute." Wegelin "will remain in existence to finalise the closure of all remaining US client relationships and to continue the negotiations with the US justice authorities," the companies said in a statement. "We are determined to see the legal negotiations through to the end," Wegelin senior managing partner Konrad Hummler said. Wegelin representatives have been summoned to appear Feb. 10 in Manhattan before Judge Jed Rakoff, who has made headlines for his hard-charging approach to financial crime in cases against firms like Bank of America (BAC, Fortune 500) and Citigroup (C, Fortune 500).